Social media and search engine optimization (SEO) are two different strategies, but when implemented, work very well together. Both are organic and inbound strategies that build a brand’s identity and attract visitors to the website without paid advertising. When it comes to social media, businesses need to rely heavily on high-quality content and a visible, strong brand presence. 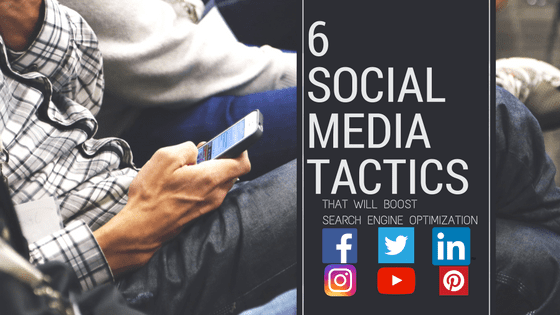 When you implement social media tactics into your SEO campaigns, you’ll not only improve your social media reach but your organic rankings as well. The number of followers and connections you have on your social media platforms will have an impact on your rankings. A company with so few followers or likes will not receive the same ranking bonus as a large company with millions of likes and followers on Facebook and Twitter. This doesn’t mean you have to have over a million followers on social media to organically improve your website’s SEO. Google detects your quality of followers; buying 100,000 likes will not help you with your rankings. That’s why we recommend you build your following organically. Growing your followers from an organic standpoint will be slow, but it’s effective provided there is consistency. Presenting your brand in a unique manner using the same voice to update your followers will go a long way. Ensure you post engaging blog content that is relevant to your followers and entices them to react to the posts. You should also follow up with your followers by directly engaging them in conversation. Directing conversations and customer engagement will build a retainable, interactive following. It will encourage your followers to come back and help with building authority for new, potential followers. Social media is important because it will encourage external sites to link to your page. It’s important to have a diverse pool of links for more authority; Google will take notice. The trick here is ensuring that you provide high-quality and authoritative content. Social media will serve as your broadcasting channel. The content you have, assuming it is useful and original, will be your bait, while the social media platforms will act as the fishing poles, ensuring the bait is in front of the eyes. Using hashtags with your posts is a good idea because it will help your visibility for the initial rounds of syndication. You should never hesitate to bring in your content into an existing discussion or thread. Doing this will help your brand become an authoritative leader in the industry, and more importantly, maximize your potential external link sources. This strategy can also be applied to pre-existing content; it will open a secondary channel for search. Google will favour popular social media updates at the top of the search engine results page, just like they do news articles and knowledge graph entries. This will be temporary, but you will have to ensure that your posts have been properly optimized for such an opportunity. You will first need to have a strong anchor for the post. This is going to serve as a foundation. You need to title it in a descriptive and accurate way. When posting it, you have to frame the foundation with the text that has been optimized for a given type of search. You can add a couple of seasonal keywords into the post to ensure maximum timeliness and increase the chance of your post showing up in search results. This will contribute to the brand authority in the same way external links do. Search engines such will improve your domain authority if your content is validated by quality links. If you get ten people to share your posts on Facebook, it’s a great start. If you get shares in the thousands, then that is even better. Shares, likes, replies, favourites, and retweets will help in increasing authority. You need to appeal directly to your followers if you want to encourage social sharing. A good example is offering a reward for people who share the post, like entering a draw to win something. Another approach to consider is coming up with an interactive survey where you can encourage followers to like or comment if they agree with something. The good part about developing a digital marketing strategy is it’s a cycle where the more shares you get, the more the followers you gain, and the more the followers you gain, the more the shares you get. Social media provides you with the perfect opportunity to engage with the local community, which sends local-specific authority signals to major search engines. The simplest way to do this is post whenever your company is participating in a local event, and interact with other local brands on social media. When the company attends local events, tradeshow, festival, or any other event, make sure you take photos and make a post where you invite other local residents to comment. This will help in reinforcing the participation in your community and will make your brand visible in local searches. The significance that brand awareness has on SEO cannot be overstated. When you improve your brand’s reputation online through engagement and quality sharing, you’re increasing your online brand presence at the same time. This increased brand presence will result in higher, more branded searches on search engines. The more searches you get, the higher the likelihood of ranking for non-branded keywords. Once you develop a strong brand on social media, you’ll have greater visibility online. There is no single proven way to improve your authority, but it can boil down to providing a quality experience. The above for the most part are the important elements of succeeding in social media marketing campaigns. Just like with SEO strategies, the whole thing comes down to one thing; the better experience you give your users, the higher your rankings on search engines. Understanding how social media impacts SEO will help you manage campaigns, resulting in greater results. Moreover, this opens up your brand to attract new customers entirely. How does incorporating keywords increase our search engine traffic?? With proper keyword research, you’ll understand how exactly your target audience is searching for the product or service you have to offer. When your website and content includes those relevant keywords, search engines will take notice when they crawl your website looking for relevant keywords. The better your website matches what your target audience is looking for, the higher ranking your website will have organically. The more people finding you on search engines is exactly what you need to bring that traffic to your website.